One of the US student movement leaders David Hogg has been caught up in a scandal involving Laura Ingraham, the Fox News host. 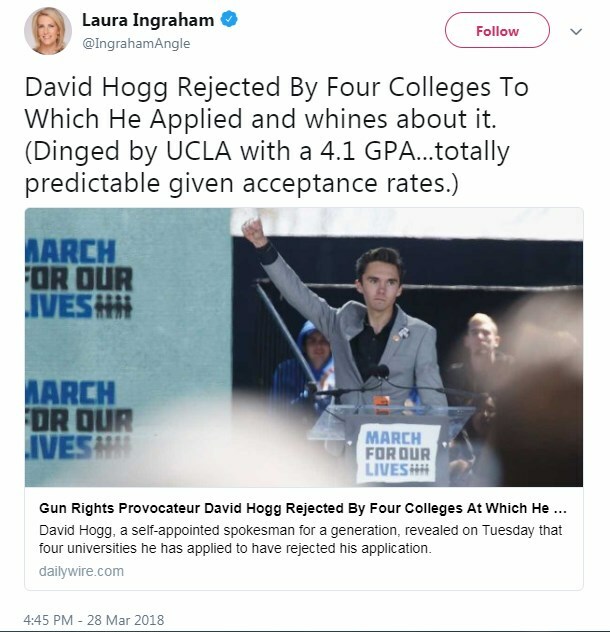 On March 28, Laura Ingraham tweeted a link to an article on David saying the ‘gun rights provocateur’ had been rejected by 4 colleges he applied to. If this wasn’t enough, the Fox News opinion-show host made her own comment saying David is now ‘whining about it’ [the fact of being rejected, that is]. 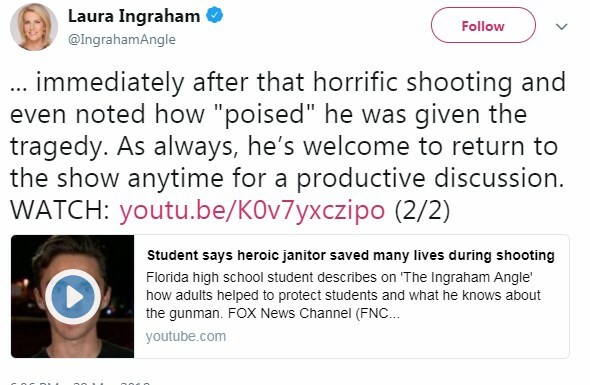 Ingraham’s comment has been interpreted by as offensive, given the fact David Hogg is one of the Parkland shooting survivors. In response to Ingraham’s tweet, David Hogg has urged people to boycott Ingraham's advertisers. The tweet has gone out to 2.2 million Twitter following the Fox News host on Wednesday morning making its way back to Hogg approximately 10 hours later. "Soooo @IngrahamAngle what are your biggest advertisers ... Asking for a friend," #BoycottIngramAdverts. 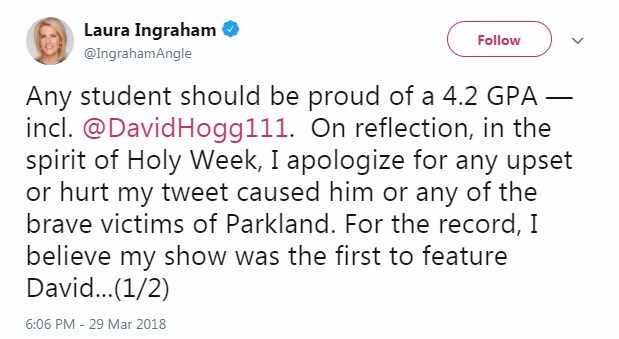 A bit later, Hogg tweeted a list of advertisers on Ingraham's show urging his followers to boycott them. This is not the first time when Fox hosts have been targeted by the boycott campaigns. Hosts Sean Hannity and Bill O'Reilly also had their share, the latter was forced off the Fox network after being involved in a sexual-harassment scandal last year. Which Companies Supported Hogg’s Boycott? As a result of Hogg’s boycott urge, at least 6 advertisers announced they would stop buying ads on the show. Expedia representative has confirmed cutting promo ties with the program.